For six weeks starting Feb. 1, the Annandale Public Library will be participating in a statewide one-book program called Once Upon a Reader. The book selected for the inaugural 2014-2015 Once Upon a Reader program is ‘Moo!’ The book was written by David LaRochelle and illustrated by Mike Wohnoutka, both Minnesota residents. ‘Moo!’ is the winner of the 2014 Minnesota Book Award in Children’s Literature. 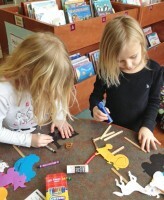 Each week the library will have self-guided programs available for parents and their children to complete together. A self-guided program is just that; materials are set out and participants partake on their own without direction from a leader or presenter. Because early literacy is what a child knows about reading and writing before they actually begin to read and write, parents and children will be able to do a different activity each week based on the Every Child Ready to Read principles: Talking, Singing, Reading, Writing and Playing. The program will conclude on March 18 with a drive-in Moooovie event where parents and their preschooler will make a cardboard box car and view the film ‘Moo’ while enjoying a tasty snack. Registration is only required for the Drive In Moooovie. All other programs are available to patrons throughout the week during library hours listed below.